Stairs can be updated to transform an ordinary entrance into an elegant looking one. Though many homeowners pay little attention to stairs, they dominate the interior design of a home. Hence, adding some aesthetic value to your staircase can ensure that you set the tone of your home as well as turn it into a beautiful focal point. With the right ideas and tools and depending on the design you choose, updating your stairs can take a matter of days. Four ways to update interior staircases include painting, working on the risers, painting the walls and changing the handrails. 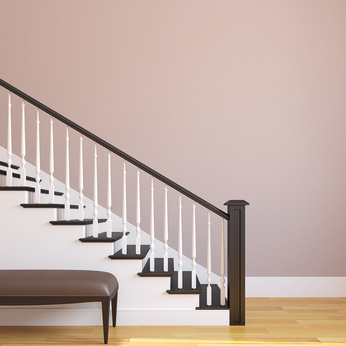 Painting is among the top five ways to update interior staircases. Paint your stairs in a fun color to make it more glamorous and to add some color to your home. Choose a color that harmonizes your home decor. Include some graphics or paintings. For instance, paint a border on the stairs sides. It will create the illusion of a runner going up the stairs. Modify your baluster if you have a larger budget. Use a modern metal style or wrought iron if your stairs no longer match your home decor. This will also work if the handrail looks outdated. Use a rope or tree branches to replace a wooden handrail affixed to the wall. Alternatively, replace the ornate rails with a style that is easy to clean, and which gives the staircase a more modern look. In addition, use striking modern patterns like spirals or zigzags to design your custom rails. However, painting the wrought iron staircase rail can be tricky so proper preparation is vital. Spray paint is considered the best option. Risers refer to the perpendicular members of a staircase. Update the risers by tiling them. This creates spectacular aesthetics. Also, consider tiling the entire area if you have a landing to add more drama. As an alternative, wallpaper or paint the risers. If you want your treads to remain in natural hardwood, then consider including some design or color to the risers. Stencil a floral design or pattern to make an impact. Instead of using similar patterns repeatedly, experiment with different designs to make it more striking. Wall beautification is one of the five ways to update interior staircases. Use new artwork to decorate the wall on top of the stairs. For instance, take down the kids’ pictures that are in outdated frames and move them to exquisite ones. Use a uniform color for the frames. To complement the frames, include a collection of travel posters or antique mirrors.